a roof circular or (rarely) elliptical in plan and usually hemispherical in form, placed over a circular, square, oblong, or polygonal space. Domes have been built with a wide variety of outlines and of various materials. high, tapering structure crowning a tower and having a general pyramidal outline. The simplest spires were the steeply pitched timber roofs capping Romanesque towers and campaniles. In later Romanesque architecture the spire was commonly octagonal, topping a square tower. ..... Click the link for more information. and embody such features as the dormer window, cupola, or minaret. Pointed-roof construction includes the tie-beam, trussed-rafter, collar-beam, and hammer-beam types. English churches and halls afford many examples of these various methods, some of which have highly decorative open-timber interiors. The simplest roof covering is thatch (of straw, palm leaves, or other fibers) used by the peasants of many lands. Other finishing materials include wood (usually shingles), tile, slate, tin, lead, zinc, copper, felt, and tar. 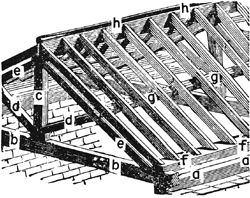 A roof's ridge is the point where the rafters meet; its principals, the purlins, resting on center or side posts, support the rafters; a valley or trough is formed by the junction of two slopes (e.g., where an ell joins the main structure). The eaves, or overhang, carry gutters or themselves drain water beyond the walls, and in the chalet and bungalow they are very wide. The concave curve of East Asian roofs is said to follow the graceful lines of a sagging tent. The classical Greek roof was of marble slabs upon timber framing and sloped gently. Early Roman roofs also were timber framed (as in the basilicas), but vault and dome construction (as in the Pantheon) were prominent in later buildings. The pointed arch and vaulting gave the slope to the Gothic roofs of Europe, while roofs in Renaissance Italy, except those with domes, were concealed, but France and Germany of this period emphasized the gable. Stepped gables are characteristic of Dutch and German roofs. Cone-topped turrets are common on the steep roofs of French châteaus. Roof ornamentation consisted of finials, crockets, crestings, gable crosses, bosses, and fantastic gargoyles (that also served as waterspouts). Roof decoration was particularly elaborate in early Asian and Gothic architecture. In contemporary architecture, roofs can span great distances with little material and few supports because of advances in the methods of using concrete and steel. Green roofs, which have used mainly since the late 1980s, lessen the environmental impact of traditional roofs, especially in urban areas. The roof surface of a building is covered with soil or another growing medium that is planted with grasses, flowers, or other plants. Green roofs reduce storm water runoff, reduce roof heating (mitigating urban "heat islands" and lowering cooling costs) and insulate the building (lowering heating and cooling costs). See T. Hamlin, Forms and Functions of Twentieth-Century Architecture (1952). A roof of semicylindrical section capable of spanning long distances, parallel to the axis of the cylinder. A roof whose cross section is shaped like a bell. A form of mansard roof in which the lower roof slopes downward in a straight line, then curves outward at the eaves. Flat roof covered with multiple layers of roofing felt, secured with layers of hot tar, and topped with a layer of crushed stone. A roof shape that has two surfaces that rise from a valley at the roof’s centerline to the eaves. A roof that is in the shape of a suspended cloth canopy; often used over a balcony or porch. A convex-shaped roof formed either by curved rafters or by a combination of beams arranged in a vault. A roof in the shape of an inverted cone on top of a cylindrical tower; used in the Chateauesque and Queen Anne styles; also called a witch’s hat. A pitched roof that slopes away from the ridge in two successive planes, as a gambrel or mansard roof. A roof composed of two parallel gables forming the shape of the letter M on the end wall. A hipped roof having a double slope. A type of gambrel roof that has two flat surfaces on each side of the ridge, each at a different pitch; the top slope is the flatter of the two, while the lower slopes often end in a flared eave. A gable roof divided into two sections of unequal slope; the flatter slope is from the top of the ridge, and the steeper slope connects to the top plate. A roof having no slope, or one with only a slight pitch so as to drain rainwater; a roof with only sufficient slope to effect drainage. A roof having a gable at one or both ends; a roof sloping downward in two opposite directions from a central ridge, so as to form a gable at each end. A roof with two pitches on each side. A roof without a tie beam at the top of the wall. Four faces rest diagonally between the gables and converge at the top. A roof which slopes upward from all four sides of a building, requiring a hip rafter at each corner. A hip roof on a building with an irregular plan, with valleys at the inside corners. A shell roof in the form of a hyperbolic paraboloid, generated by two systems of straight lines. A combination of a gable roof and a hipped roof; the gable rises about halfway up the ridge, then the roof is tilted back at a steep incline. A roof frame consisting of a series of skewed arches, made up of relatively short members, fastened together at an angle so that each is intersected by two similar adjacent members at its midpoint, forming a network of interlocking diamonds. A roof formed by the junction of two parallel gable roofs with a valley between them. A roof with a steep lower slope and a flatter upper slope on all sides, either of convex or concave shape. A roof whose section is an ogee. A roof construction in which there is no ceiling so that the rafters and roof sheathing are visible from below. A small sloping roof, the upper end of which butts against a wall of a house, usually above the first-floor window. If carried completely around the house, it is called a skirt roof. A roof having one or more slopes or surfaces. A pavilion roof having more than four sides is a polygonal roof. Same as a pavilion roof. A circular roof with a low slope and overhanging eaves. A roof having a concave-shaped ridge with gables at each end of the roof, suggesting a saddle. A ridged roof, with short gable ends and a straight ridge, typically found on the top of a tower. A roof system having a number of small parallel roof surfaces with a profile similar to the teeth in a saw; usually the steeper side is splayed and faces north; usually asymmetrical with the shorter slope glazed. A roof having only a single slope on each side of a central ridge, compared to a shed roof, which has a single slope, but without a central ridge. A roof composed of a thick layer of grassland containing roots; frequently it is pitched or barrel-shaped and supported by logs or other wall structure. A roof where rafters on opposite sides of the ridge meet at a 90-degree angle; each side of the roof has a slope of 45 degrees. A roof constructed of stones which are arranged in a stair-stepped fashion, diminishing toward the top in a peak. A roof whose load is carried by a number of cables which are under tension from columns or posts that are in compression and that transmit the loads to the ground. A roof that has been truncated so as to form a flat horizontal surface without a ridge. A roof comprised of a structural system wherein the voids are filled with a material that lets light pass through, but is not transparent. A structural system that is composed with an all glass infill, similar to those used in greenhouses. A roof with sloped sides and a flat top for a terrace; may have a balustrade around the flat center section. A shell roof formed by four hypar shells. A roof that exhibits a wavy. A relatively small section of roof that projects on brackets from a flat wall surface; sometimes it appears below a parapet, as in the Mission style. the top enclosing structure of a building. It consists of a supporting element (rafters, trusses, purlins, panels, and so on), which transmits the load from snow, wind, and the weight of the roof itself to the walls and separate supports, and an outer envelope, or roofing. Roofs are made with or without attics or lofts. A roof with a loft may be heated or unheated. An unheated roof protects a building only from atmospheric precipitation; thermal protection of the upper floor spaces is provided by the attic ceiling. In roofs without lofts or attics, the roof itself fulfills the function of the attic ceiling; in this case, the roof is called a ceiling floor, covering, or combined roof. The inclined surface (for water runoff) of the roof is called the slope (pitch); the line of intersection of the two slopes that form the outer slope angle is called the rib, and the line of intersection forming the inner slope angle is called the valley; the upper horizontal rib of the roof is called the ridge, or crest. The pitch of a roof is determined by the roofing material, the climatic conditions, and architectural and service requirements. (in mining), rock located above a mineral seam. A thin layer of barren rock that lies directly above a mineral seam and crumbles spontaneously soon after its removal is known as a false roof. In coal mining, a distinction is also made between the nether roof (layers of barren rock located directly above a coal seam, whose controlled destruction occurs after the face advances) and the main roof (layers of rock located above the nether roof, whose destruction is virtually uncontrollable and takes place over long intervals of time, depending on the strength and thickness of the rock). (in Russian, pokrytie), the upper structure that separates the rooms of a building from the outside and protects them from the outside environment. The term pokrytie is used mainly to designate the roof of industrial buildings, whereas in the construction of residential and public buildings the term krysha is used more frequently. As a rule, a roof consists of the roofing material, insulation, moistureproofing, and a supporting structure. Some parts of the structure, such as decking constructed of light or cellular concrete, may also provide thermal insulation and, sometimes, moistureproofing. The supporting structure is the most important component of a roof, since it determines the shape (flat, domed, or vaulted) of the roof and the internal and external appearance of the building. There are many different types of supporting structures, including horizontal slabs (flat, corrugated, or hollow) resting on beams; rafters (flat or spatial); thin-walled shells; and folding, suspended, pneumatic, and other structures. The supporting structures of a roof can be made of reinforced concrete (precast or cast at the construction site), metal, asbestos cement, and, less frequently, wood. In modern construction engineering, supporting structures are being produced that are longer, wider, and lighter than those produced previously. Their erection is also less labor-intensive. Among the methods being introduced is the use of metal intersective structures; large, prefabricated, thin-walled shells; suspended structures; long panels; and contoured metal slabs. The insulation usually consists of sheeting (lightweight aggregate concrete, perlite concrete, or foam concrete) or loose materials (clay filler, blast furnace slag, or microporous rubber). Cellular concrete, cast at the building site, is used less frequently. Moistureproofing is usually provided to protect the insulation from being penetrated by the moisture in the rooms (particularly in industrial buildings). It usually consists of one or two layers of tar paper applied over bituminous cement. The accumulation of moisture can also be prevented by the use of ventilated roofs, which have openings and vents leading to the outside. The uses of a building determine whether the roof has skylights, one or several spans, or interior or exterior drainage. Some roofs are designed as flat decks with parking facilities, restaurants, playing fields, solaria, or pools. Konstruktsii grazhdanskikh zdanii. Edited by M. S. Tupolev. Moscow, 1968. What does it mean when you dream about a roof? A roof symbolizes a cover for that which needs protecting. It can also indicate a barrier between two states of consciousness. A leaking roof sometimes means that there is new information dripping through. The cover of a building or similar structure. The rock above an orebody. The country rock bordering the upper surface of an igneous intrusion. The rock immediately above a coal seam; corresponds to a hanging wall in metal mining. The top covering of a building, including all materials and constructions necessary to support it on the walls of the building or on uprights; provides protection against rain, snow, sunlight, extremes of temperature, and wind. For definitions and illustrations of the different types, see barrel roof, bellcast roof, bonnet roof, bowed roof, broken-pitch roof, bunker fill roof, butterfly roof, candle-snuffer roof, canopy roof, collar beam roof, compass roof, conical roof, curb roof, deck roof, double-gable roof, double-hipped roof, double-pitched roof, dropped roof, dual-pitched roof, Dutch gambrel roof, Dutch hipped roof, Dutch roof, Dutch slice-hip roof, earth roof, English gambrel roof, flat roof, Flemish roof, flounder roof, French roof, gable-onhip roof, gable roof, gambrel roof, Gothic roof, helm roof, hip-on-gable roof, hipped-gable roof, hipped roof, hip-on-gable roof, hyperbolic paraboloid roof, Italian roof, jack roof, jerkinhead roof, kick roof, knee roof, landscaped roof, lean-to roof, mansard roof, monitor roof, M-roof, New England gambrel roof, ogee roof, open roof, pavilion roof, pent roof, pigeon roof, pitched roof, ponded roof, principal roof, purlin roof, pyramidal roof, queen-post roof, rainbow roof, ridge roof, round roof, saddle-back roof, saltbox roof, segmental roof, shed roof, ship’s bottom roof, single-pitched roof, skirt-roof, slice-hip roof, sod roof, span roof, square roof, Swedish gambrel roof, terrace roof, thatched roof, truncated roof, umbrella roof, visor roof, wagon roof, whaleback roof. At times, a roof represents the crown choker. It may represent a barrier between states of consciousness or be symbolic of your ideology and philosophy. If you are dreaming about a leaky roof, new information may be trying to get into your conscious awareness. On a more pragmatic note, the roof in your dreams could be bringing up issues of protection and materialistic comfort (a roof over your head).